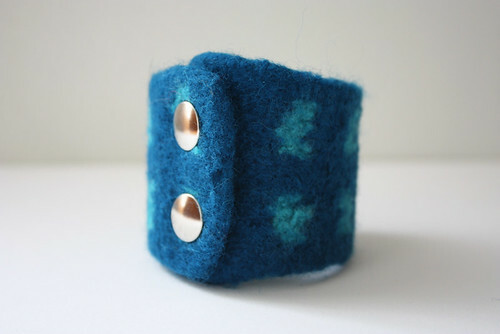 mad orange fools: Felted bracelets. 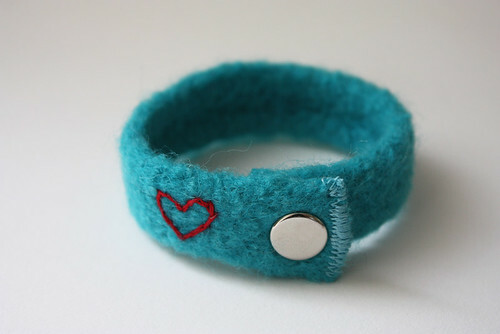 I've been playing around with making felted bracelets. I made this one awhile back, but it is only recently that I was able to finish it with the snaps. The felt is just thick enough that regular snaps do not work so I had to find long-pronged snaps. (The Snap Source saved me!) And actually, the long-pronged snaps almost weren't long enough, but after some steam ironing and persistence, I made them work. As a finished bracelet, I think it turned out pretty darn cute! This one was supposed to be about half the size of the first one, but as always with felting, you never know what's going to happen! The edges curled under quite a bit so it's less than half the size of the first, but it still works. I again used the steam iron to flatten it up some. Yay for steam irons! I don't think these are the best items for spring/summer since they are wool, but they will definitely be perfect for fall/winter! I really need to hone my embroidery skills though. I love the idea of embroidery on the felt, but since I am a novice embroiderer, free hand embroidery is tough for me. Just gotta keep trying, I guess. Last week, I made another batch of bracelets to see if I could "size" them and, well, it's tough. I used different brands of yarns and they all seem to shrink up differently. Plus I have really small wrists so I am not quite sure what the right size is for everybody else! (Feel free to leave me your wrist size in the comments!) This week I'll try a few more and cross my fingers that they turn out well. I've been crocheting more than knitting lately (although the bracelets are knitted) and it's quite fun. Making lots of little bowls and a few new designs. I'll have them ready to show you soon. This week I think I am going to take some time off to work on the garden and take care of some other projects. I love my work, but right now I need some time off the couch and some time outside! It is spring after all. The rest of the pack. Some recent instant film faves.